I didn't realize they made chicken strips. I'll have to try those with the Ibotta offer! I like to have stuff like that on hand for quick weeknight meals. I love Morning Star products. I grew up with them, and I eat them every day. Finding a good deal on them is awesome because they're pretty expensive! I love the ibotta app! In fact I just scored 0.25 tonight for buying an avocado! There are always things I buy on there - and some I don't but it's ok! I used to eat Morningstar patties, but haven't had them in a while. Ibotta is my favorite shopping app though! I love the rebates! Earning $3 on products I love is a win win situation. I'm headed over to ibotta which I use all the time. Thanks for the heads up. That is a great way to eat less meat for sure. Their products are so good I don't even miss the meat when I eat them. I have a lot of recipes that these work perfectly in. I need these for my house. I am always forgetting to eat breakfast. More often it's cause I don't have time. This would make it easier. I haven't tried Morning Star and with a high coupon now would be a perfect time. The tacos look so good. This is something new for me! Ill definitely get some in Walmart next grocery time! This is a great offer. Prefect for stocking up on Morning Star Farms products. Thanks! I love Ibotta and how I can save a few bucks each grocery trip thanks to their instant savings. Ibotta is absolutely amazing. If I am going to go grocery shopping for great products, like Morningstar Farms, why not take advantage of cashback that is offered. I've been using Ibotta for years and love that it is gaining traction with the "general" public and not just couponers. Awesome!! These products are for me. Plus, there's a cash back. Wow! I have to look for this next time I go shopping. 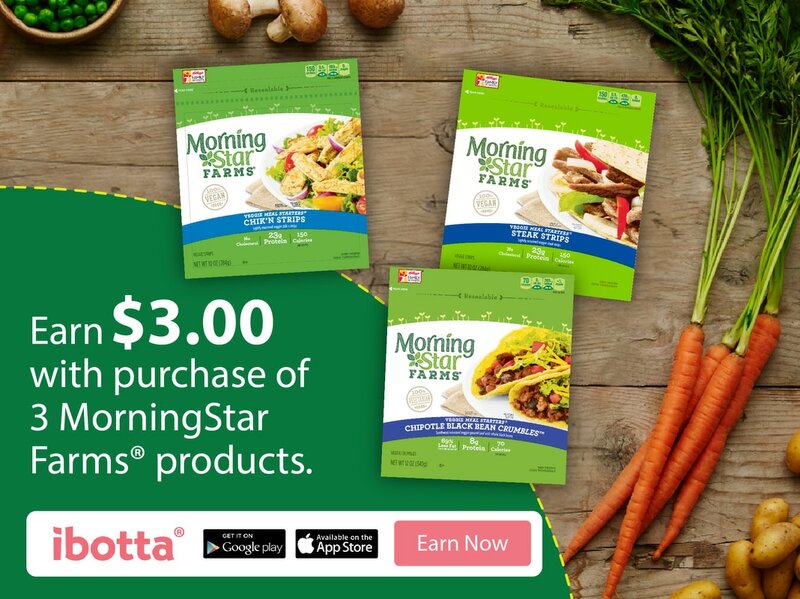 I love using Ibotta to score extra cash back, and Morning Star Farms is one of my favorites! I'll definitely be looking at stocking up with this deal!